Vector Aerospace UK announced today that it has been awarded an extension to the Lynx Aircraft and Component Servicing , Repair and Overhaul contract by the Ministry of Defence. The announcement, which will secure Lynx depth maintenance at the site, has rewarded the company’s commitment to the strengthening of relationships with its customers by offering superior service through rigorous implementation of process innovation. The Fleetlands operation has been the main UK provider of depth maintenance support to the Lynx Fleet throughout its 32 year service and has been the sole provider of this service to the Royal Navy and Army Lynx fleets since 2005. “Vector Aerospace has an unrivalled record for support to the UK MOD”, said Michael Tyrrell, UK Managing Director. “We are delighted to be extending this service, ensuring that the UK Lynx fleet can meet all of its current and future requirements”. 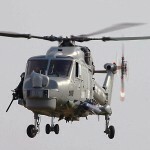 The extension of the Depth arrangement will provide support to the Army and Royal Navy Lynx aircraft up to the end of 2015. Col Darren Crook, Lynx Team Leader said, “We are pleased to have secured an extension to the Lynx Depth arrangements with Vector Aerospace International Limited. It will allow us to continue supporting the Front Line Commands with well maintained airworthy aircraft, which is a fundamental role of the Lynx Project Team”.